Low-power magnification of prostate core biopsy showing stromal tumor of uncertain malignant potential at right and sharp demarcation from benign prostatic tissue. Note increased cellularity and hyperchromasia of nuclei and haphazard arrangement of cells. High magnification of stromal tumor of uncertain malignant potential showing myxoid stroma and degenerative cells. The neoplastic nature of these proliferations remains controversial, with arguments favoring these lesions to be hyperplastic or pseudosarcomatous processes existing to date. [4, 5, 6, 7] On the opposite spectrum of malignancy, true stromal sarcomas represent the malignant counterpart of lesions arising in the specialized stroma and are not discussed in this article. 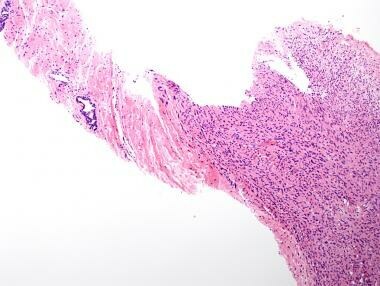 The etiology and the pathogenesis of stromal tumors of uncertain malignant potential (STUMP) are unknown. No risk factors have been associated with these proliferations. Stromal tumors of uncertain malignant potential (STUMP) have been reported in both young patients and elderly patients (age range, 27-83 y), with most patients older than 50 years. 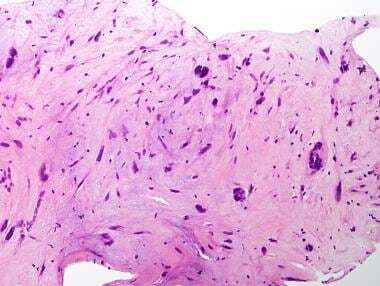 Stromal tumors of uncertain malignant potential (STUMP) are grossly characterized by solid masses with occasional cystic spaces filled with mucinous or clear fluid. Stromal tumors of uncertain malignant potential (STUMP) are stromal proliferations characterized by hypercellularity and/or cytologic atypia without evidence of true sarcomatous transformation. The atypical stromal cells have enlarged nuclei with nuclear hyperchromasia and occasional multinucleation. Few or no mitotic figures are present in reported cases of STUMP, and the occurrence of atypical mitoses should make the pathologist highly suspicious of a prostatic stromal sarcoma or other sarcomas involving the prostate. An association with prostatic glands is common, which are histologically benign. Myxoid pattern, which is set apart by extensive overgrowth of myxoid stroma that resembles the stroma of benign prostatic hyperplasia. STUMPs may have a mixture of patterns. Immunohistochemical staining of stromal tumors of uncertain malignant potential (STUMP) reveals positivity with vimentin, progesterone receptor, actin, and CD34 in variable amounts. A few cases also show estrogen receptor positivity. Beta-catenin was reportedly positive in one case of STUMP. Ki-67 proliferative index is low but not discriminatory from stromal sarcomas. Negativity for CD117 allows distinction from gastrointestinal stromal tumors in small biopsy samples. No information is available on genetic alterations of stromal tumors of uncertain malignant potential (STUMP). Stromal tumors of uncertain malignant potential (STUMP) are most often confined to the prostate. Gaudin PB, Rosai J, Epstein JI. Sarcomas and related proliferative lesions of specialized prostatic stroma: a clinicopathologic study of 22 cases. Am J Surg Pathol. 1998 Feb. 22(2):148-62. [Medline]. Michaud S, Moreau A, Braud G, et al. [Prostatic Stromal Tumors of Uncertain Malignant Potential (STUMP): definition, pathology, prognosis and management]. Prog Urol. 2012 Oct. 22(12):688-91. [Medline]. Murer LM, Talmon GA. Stromal tumor of uncertain malignant potential of the prostate. Arch Pathol Lab Med. 2014 Nov. 138(11):1542-5. [Medline]. Attah EB, Nkposong EO. Phyllodes type of atypical prostatic hyperplasia. J Urol. 1976 Jun. 115(6):762-4. [Medline]. Young RH, Scully RE. Pseudosarcomatous lesions of the urinary bladder, prostate gland, and urethra. A report of three cases and review of the literature. Arch Pathol Lab Med. 1987 Apr. 111(4):354-8. [Medline]. Tetu B, Ro JY, Ayala AG, Srigley JR, Begin LR, Bostwick DG. Atypical spindle cell lesions of the prostate. Semin Diagn Pathol. 1988 Aug. 5(3):284-93. [Medline]. Hossain D, Meiers I, Qian J, MacLennan GT, Bostwick DG. Prostatic stromal hyperplasia with atypia: follow-up study of 18 cases. Arch Pathol Lab Med. 2008 Nov. 132(11):1729-33. [Medline]. Hansel DE, Herawi M, Montgomery E, Epstein JI. Spindle cell lesions of the adult prostate. Mod Pathol. 2007 Jan. 20(1):148-58. [Medline]. Wee HM, Ho SH, Tan PH. Recurrent prostatic stromal tumour of uncertain malignant potential (STUMP) presenting with urinary retention 6 years after transurethral resection of prostate (TURP). Ann Acad Med Singapore. 2005 Aug. 34(7):441-2. [Medline]. Herawi M, Epstein JI. Specialized stromal tumors of the prostate: a clinicopathologic study of 50 cases. Am J Surg Pathol. 2006 Jun. 30(6):694-704. [Medline]. Kawamura N, Nakai Y, Minato N, et al. [Case report of prostatic stromal tumor of uncertain malignant potential (STUMP)]. Hinyokika Kiyo. 2010 Apr. 56(4):237-40. [Medline]. Kakuta Y, Kobayashi Y, Tanaka M, Yazawa K, Harada Y, Itoh K. [A case of prostatic stromal tumor of uncertain malignant potential]. Hinyokika Kiyo. 2005 Dec. 51(12):843-6; discussion 846-7. [Medline]. Kawamorita N, Inaba Y, Soma F, Katayama Y, Mikami Y. [Giant phyllodes tumor of the prostate]. Nippon Hinyokika Gakkai Zasshi. 2007 Sep. 98(6):781-5. [Medline]. Fukuhara S, Matsuoka Y, Hanafusa T, et al. [A case report of prostatic stromal tumor of uncertain malignant potential (STUMP)]. Hinyokika Kiyo. 2008 May. 54(5):377-81. [Medline]. Roos FC, Sommer S, Hampel C, Melchior SW, Thuroff JW. Extraprostatic spindle cell stromal tumor of the prostate: case report. Urology. 2008 Jun. 71(6):1226.e13-5. [Medline]. Persaud V, Douglas LL. Bizarre (atypical) leiomyoma of the prostate gland. West Indian Med J. 1982 Dec. 31(4):217-20. [Medline]. Petersen RO, Sesterhenn IA, Davis CJ. Prostate. Urologic Pathology. 3rd ed. Philadelphia: Lippincott, Williams & Wilkins; 2008. 451-560. Nagar M, Epstein JI. Epithelial proliferations in prostatic stromal tumors of uncertain malignant potential (STUMP). Am J Surg Pathol. 2011 Jun. 35(6):898-903. [Medline]. De Berardinis E, Busetto GM, Antonini G, et al. Incidental prostatic stromal tumor of uncertain malignant potential (STUMP): histopathological and immunohistochemical findings. Urologia. 2012. 79(1):65-8. [Medline]. Pan CC, Epstein JI. Common chromosomal aberrations detected by array comparative genomic hybridization in specialized stromal tumors of the prostate. Mod Pathol. 2013 Nov. 26(11):1536-43. [Medline]. Pitt MA, Roberts IS, Agbamu DA, Eyden BP. The nature of atypical multinucleated stromal cells: a study of 37 cases from different sites. Histopathology. 1993 Aug. 23(2):137-45. [Medline]. Higher magnification of stromal tumor of uncertain malignant potential showing cellular details. Although pleomorphism is present, the cells lack large nucleoli and there are no mitotic figures. High magnification of stromal tumor of uncertain malignant potential in close association with benign prostatic glands. Some authors would consider this association in the spectrum of phyllodes tumor.